Hey everybody! Sorry about skipping last week, but while I did bring in cheese, I did not partake since I was in the midst of a week long experiment with Soylent during which I discovered that I have an iron deficiency. Science! Also, this week’s is a day late since yesterday was spent running around and cursing due to a narrowly avoided Locky outbreak at work. Distinctly not happiness. But now, on to the cheese! Starting on the left, we had Appenzeller Classic. This was a tremendously good cheese! It is almost like Switzerland’s answer to Provolone. 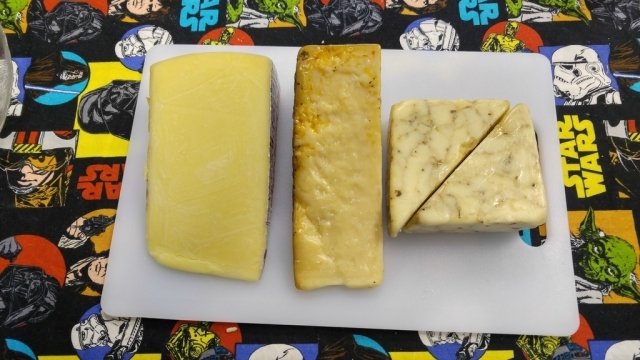 It is a smooth, firm cheese with a slightly nutty flavor and a very sharp, acidic finish. This one was a crowd pleaser, to be sure. The only thing that I hated about it was the foil that it was covered in was very thin and did not peel easily off of the cheese. I must have spent ten minutes just ensuring that the foil was all gone before I chopped it up for the masses. Next we had Stella Mediterranean Parmesan. This cheese smells and tastes just like pizza. Very good pizza. It is Stella’s Parmesan, which is really good as it is, but crusted with tomatoes, oregano, garlic, and a whole mess of other stuff before it is aged. I could have gone through the whole block by myself if nobody had been watching me. Lastly, we had Beecher No Woman. This is one of my top three cheeses of all time, and I have written about it endlessly. The reason that I brought it yesterday, though, is bittersweet. My friend Ben, who has run the Refectory at McCormick/LSTC for the last four years, is leaving us at the end of the week. He has found a new, shinier job that is closer to home, and has a boatload of paid time off. That is wonderful, and I’m ever so happy for him! But I will miss him a great deal and wanted his last Stinky Cheese Tuesday to be special, and remind him of me when he thinks back on it.